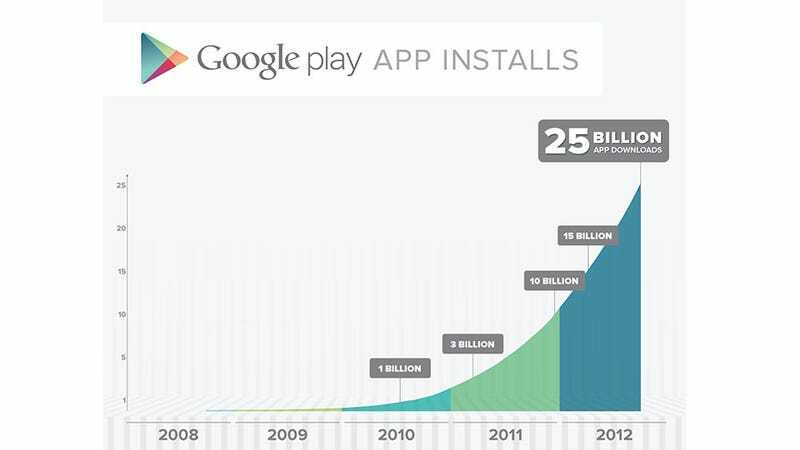 With an impressive 15 billion apps and games downloaded in the past year alone, Google has every reason to celebrate reaching the 25 billion apps milestone. And so do Android gamers, as a celebratory sale delivers titles like Angry Birds Space Premium and NFL Kicker 2013 for a quarter of a dollar. With more than 675,000 apps and games on Google Play and shiny new Android phones and tablets reaching more hands every day, 25 billion is a number that should shoot up like a rocket by next year, so the five-day sale in the Google Play store is something you should hop on right now, rather than wait for next year's dollar event. The selection of games and apps available at the celebratory price will rotate each day for five days, so frequent checking is encouraged. Along with the sale apps, Google play will also be offering special 25 item media collections, such as 25 banned books, 25 albums that changed the world or 25 random things grouped together to fit the theme. Here's to 25 billion more downloads!